Hotel Cervo in Zermatt sits right at the end of one of the ski resort ski runs. Hotel Cervo is one of the top hotels in Zermatt. It’s location is perfect, the rooms are exquisite and the staff, phenomenal. Hotel Cervo is located towards the south end of town, right at the Sunnegga lift train. The ski run empties out right in front of the hotel as well. It’s super convenient. If you’re skiing or mountain biking, you’re less than 5 minutes to the ski train. You can be in the center of Zermatt in less than 15 minutes, to the train station in 10. Walking is simple and easy, although you can also take a taxi. Expect to pay around 10 -20 CHF during peak times one way for a taxi ride into town. It’s slightly cheaper to catch the taxi in front of the Sunnegga ticket office. Taxi’s tend to take advantage of the fact that you’re staying at the Hotel Cervo. Rooms at Hotel Cervo are amazing. Rooms are spread out amongst five chalets across the property. 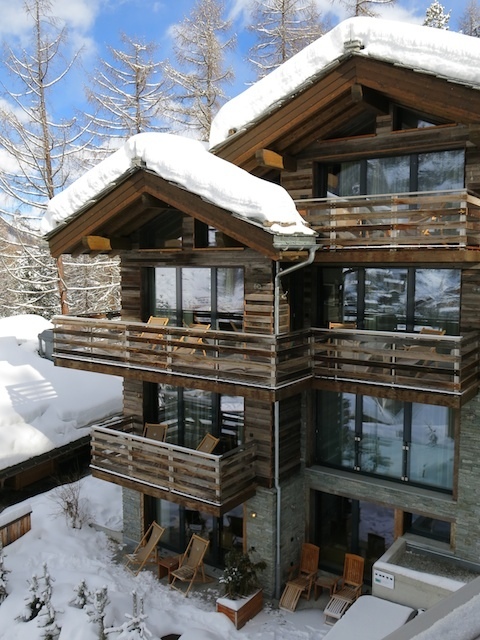 Each chalet has 4-5 floors. On the lowest floor on the least expensive rooms, as well as the wellness area consisting of a spa treatment room, relaxation area, steam room, sauna, bucket shower and outdoor jacuzzi. 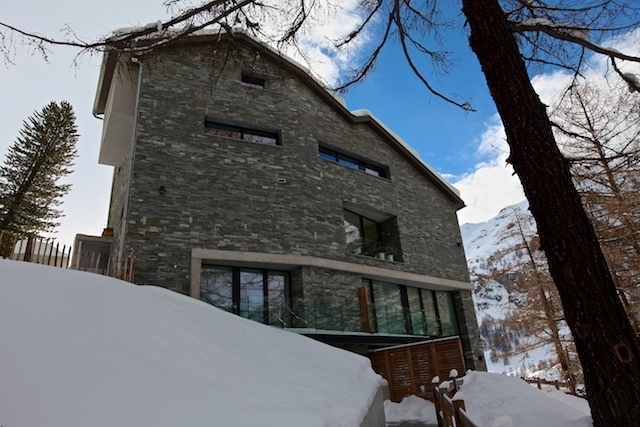 There are around 7 rooms per chalet, with the better rooms being on the upper floors. 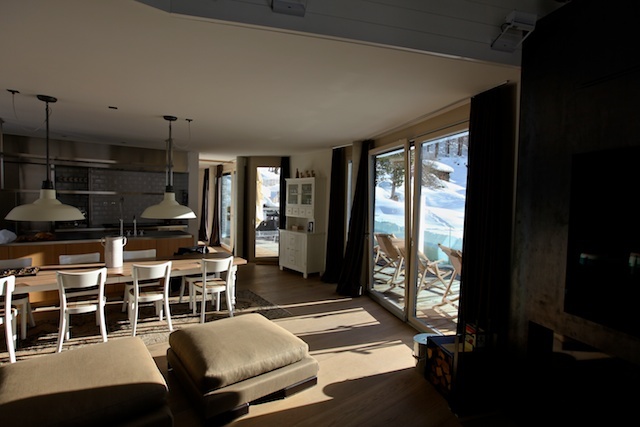 For the best, completely unobstructed views of the Matterhorn and Zermatt, you’re best bets are either the Owner’s Lodge or Chalet 5. All chalets have views of the Matterhorn, but can be somewhat obstructed by trees, especially during warm months. During our stay, we had the fortune of being able to stay in the Owner’s Lodge for one night and a Junior Suite for the following four nights. Looking from the living room of the Owner’s Lodge into the kitchen and out onto the west deck. The Owner’s Lodge is unbelievable. It shares it’s own chalet building with the Spa Suite. You can rent out both rooms and have an entire building to yourself. The Owner’s Lodge portion of the building has an elevator that accesses all four floors. Stairs are also available. Regular bedrooms are located on various levels, with the mater bedroom and bath on the top floor. There’s also a small game room on this floor as well. 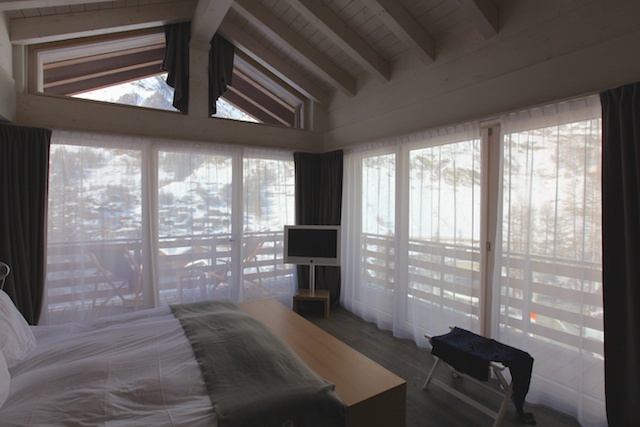 The master bedroom is outfitted with a king size Hasten’s bed and a large deck with wide open views of the Matterhorn. The master bath has a large soaking tub, two person sauna, and large shower. The same deck in the bedroom wraps to the bathroom with the awesome views. One floor down is a large, full size kitchen with all appliances, including an espresso maker. There’s a small office area with another large patio/deck facing the Matterhorn. Outside on that deck is your own private jacuzzi. There’s a dining room for 12 and large living room with premium sound system and large flat screen television. You could live here. And live comfortably. The bedroom in the Junior Suite at Hotel Cervo. The Junior Suite is also nice. They’re located in almost every chalet. The have large decks on two sides and face the Matterhorn. The bedrooms are good sized, with king size beds, a TV and plenty of underbed storage for ski clothing, etc. There’s a double-sided fireplace between the bedroom and living room. The living room is also large, with a large sectional, espresso machine and huge closet that can store all of the clothing and gear you can throw at it. A large safe for valuables is also included. In the bathroom, there’s a soaking tub, single sink, separate water closet and another large closet for hanging things, as well as storage drawers. Oh, and the most important thing, radiant heated floors are throughout the entire room. Rooms are cleaned daily, followed by turn down service in the late afternoon/early evening. Towels are refreshed, curtains drawn and the bed turned down. You also get a small gift each day, along with a list of events and weather coming up on the following day. Facilities at Hotel Cervo are everything you could want. A great, well respected restaurant helmed by the owner’s wife. Reservations are required, even if you’re a guest during high season. Breakfast is also served here as well. A large year-round bar area outside, both slope side and above that on the patio. Large wool blankets, pillows and a large fireplace keep you warm, even in the coldest of weather. There’s a small inside lounge as well, with a separate small bar area. You can order tapas as well as drinks in any of the bar locations. If you’re here to ski or bike, there’s a large heated storage room that secured by card key to keep your gear. As mentioned above, there’s a wellness area on the lower floor of each chalet. It’s open from 3:30-11PM daily. Massages and spa treatments can be arranged as needed. Since each chalet has its own wellness area, you’re never fighting for the jacuzzi, sauna or relaxation area. We hardly ever saw anyone in the area every night we were there and the hotel was booked to capacity. Staff here are amazing. Nothing is too much trouble. They’ll handle anything you need. And I mean anything. The hotel is allowed to sell lift tickets, so you can avoid any lines at the ticket office. They’ll make reservations at other spots in town to eat as well. Daniel, the owner, spoke with us several times during our stay to make sure everything was satisfactory. Pros: Everything. Your right on the ski run, as well as 5 minutes from the ski train. Cons: None, really. 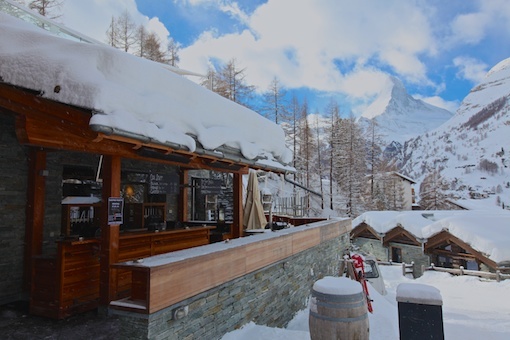 Other than this is one of the most popular places in Zermatt. You need to reserve months in advance if you want your choice of room. It would also be nice if the wellness area opened earlier, especially for those days when you didn’t choose to ski. Owner's Lodge and Spa Suite building. 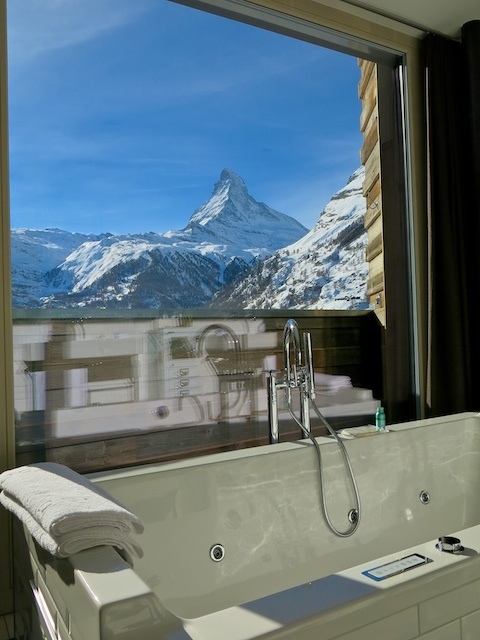 View of the Matterhorn from the Master Bath in the Owner's Lodge. Bedroom in the Junior Suite with decks on all sides. Relaxation room in the Wellness area of each chalet. 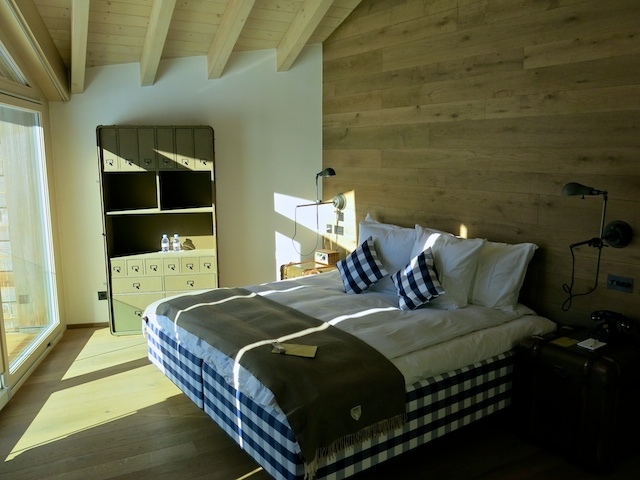 You can see more photos of Hotel Cervo and Zermatt by clicking here. Hotel Cervo runs special packages in summer and winter that are inclusive of skiing, biking, etc.